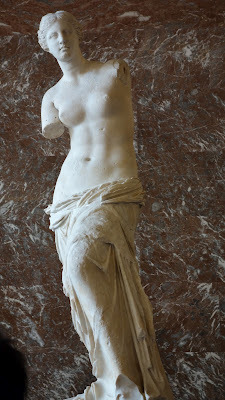 The Louvre. Well, what can we say. It is SO big, SO overwhelming, SO incredible -- and that's just the building itself! So yes, the building is amazing ... but how do we describe what's inside? The first person to comment on this entry and name the famous ladies shown will receive a special gift from us after we return home. Time to head off for another day of discovery. F A B U L O U S !! or should we say fabuleux ! !